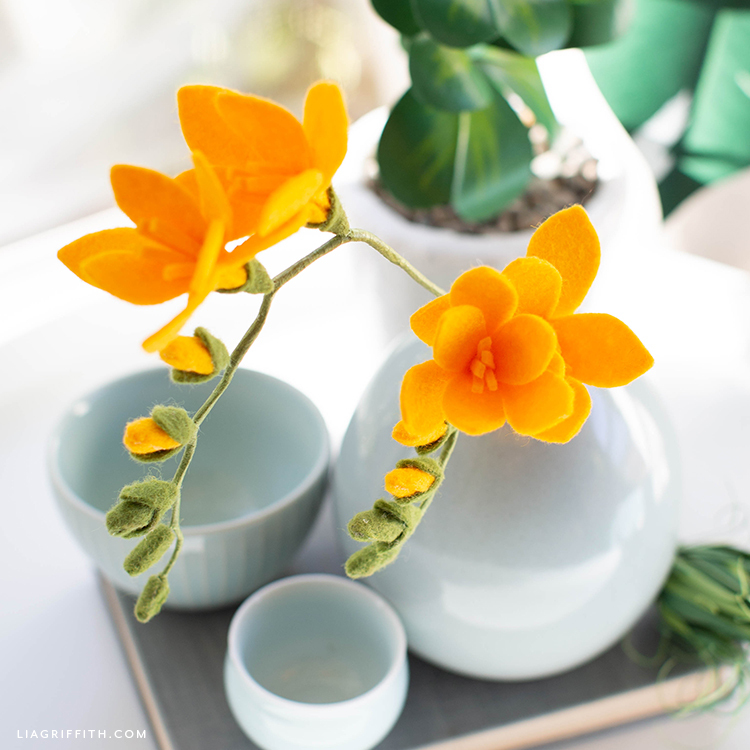 To add to our growing felt flower collection, Krista has designed this sunny yellow freesia stem, just in time for spring! 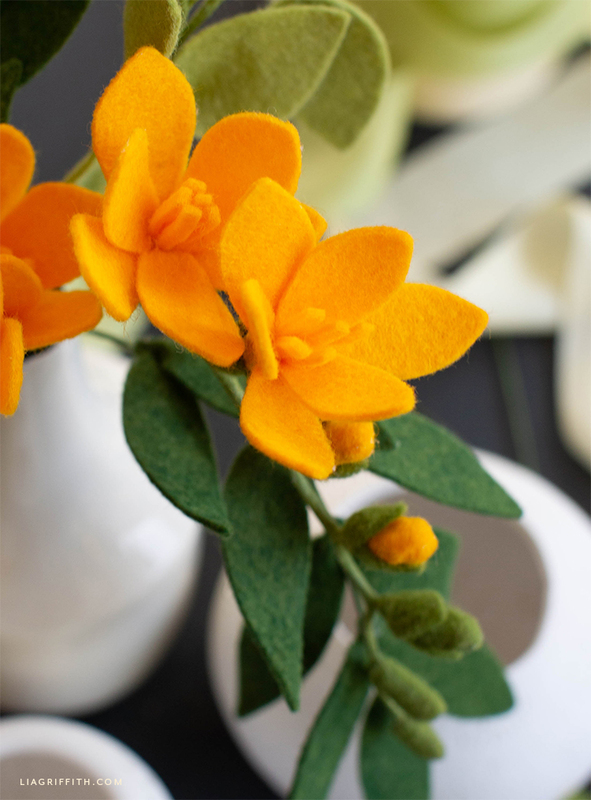 These felt freesia flowers with tiny buds running down the stem are perfect for an intermediate or advanced felt crafter. 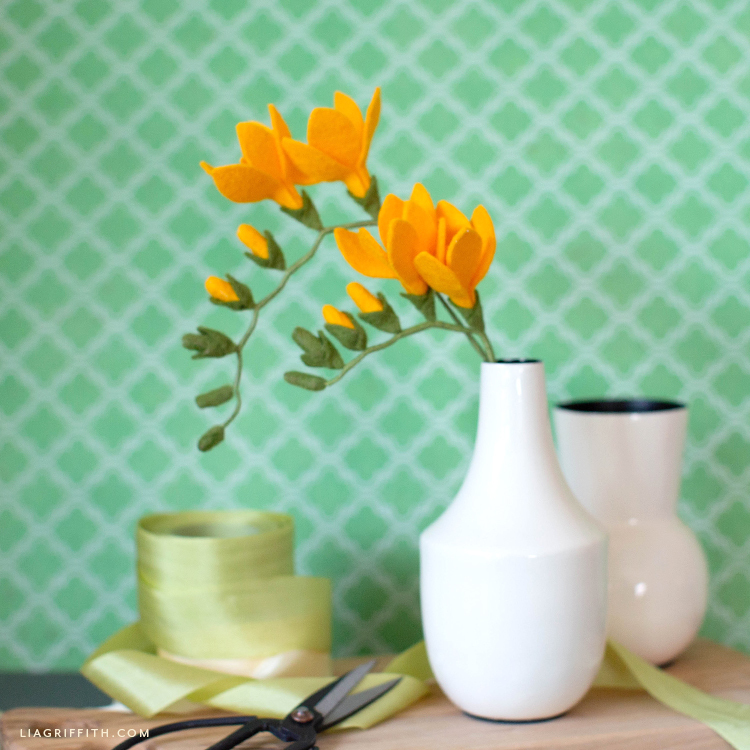 If you love freesias, we have also made a frosted paper freesia pattern for you. If you are a beginner at making felt flowers, we recommend starting with any of the gorgeous wool blend blooms on our beginning felt flower list. 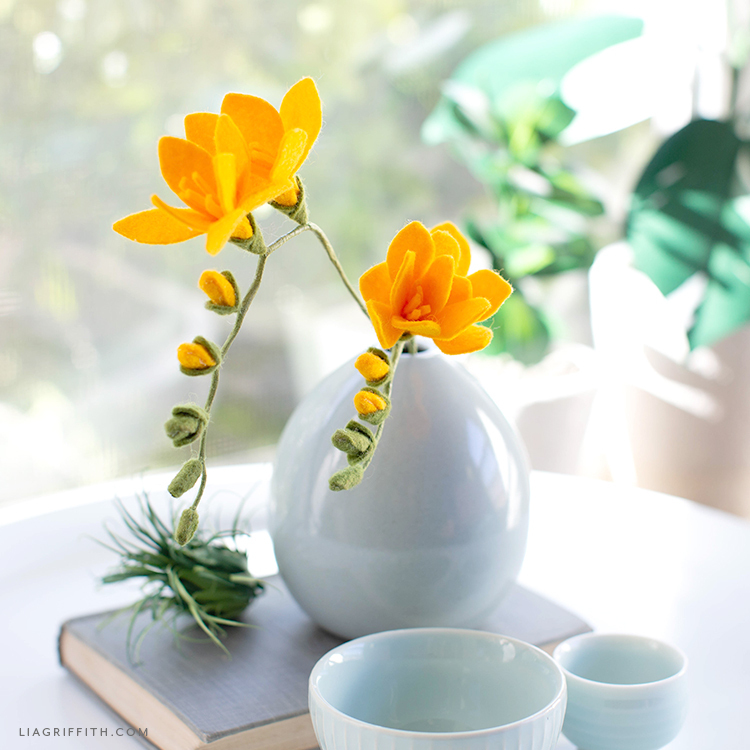 We know from experience that once you start making these pretty blooms, you will be ready for this freesia in no time. 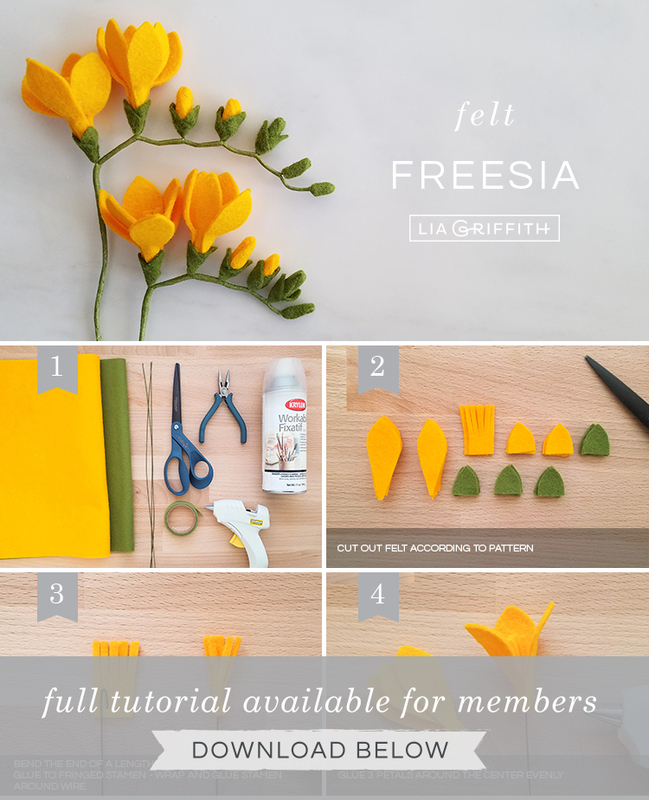 In the tutorial, we show you how to make these felt freesia flowers in a deep sunny yellow, but freesia grows in a variety of shades of lavender, dark pinks, reds, and a fresh white. Pick the colors you love or create a mix of them all. 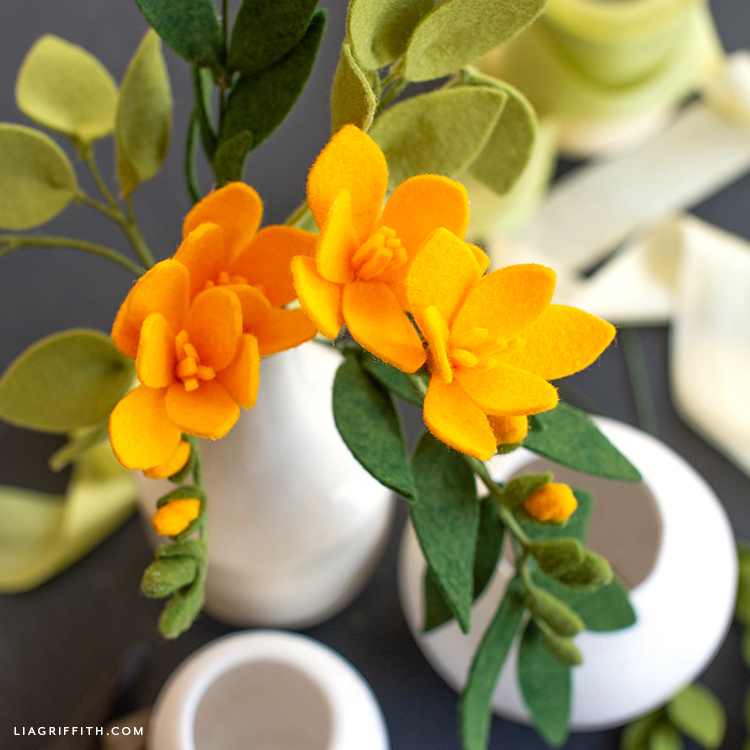 To make these felt freesia flowers, you will need the tools and materials we’ve listed here in this post as well as our flower pattern below. If you have a Cricut Maker, you can use it to cut your felt. However, these flowers are very simple to make, so this is an easy one to cut by hand. We also encourage you to share your flowers with us! You can share your handmade flowers on our Facebook page for members. Or another great way for us and other crafters to see your DIY projects is to use the #MadeWithLia hashtag on your social pages. To make a flower: Bend the end of your 24-gauge floral wire and glue to the fringed stamen. Wrap and glue stamen around the wire. Glue three petals around the center evenly, applying glue just up to where the petal starts to widen. Love to work with felt? We have more felt flowers that you can make. Or you can explore all of our felt crafts on the site.